← Let us for a tour of the garden. Après le repas de midi aujourd’hui je regardais rêveusement la vieille pompe à bras accrochée au mur dans notre cour et aussi la borne – fontaine juste à côté .. Seul, cette dernière fonctionne pour laver la voiture et arroser le jardin ( pas trop ) . 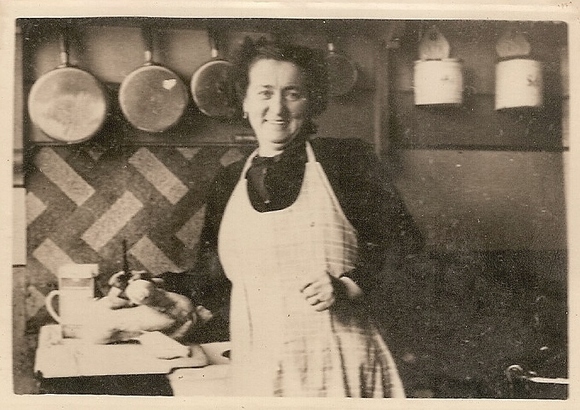 La pompe à bras se trouvait dans la cuisine de la grand’mère de Janine bien avant la guerre . De nos jours il y a beaucoup de robinets dans les maisons et aussi machines à laver , lave-vaisselle , salle de bain etc …. L’ eau courante circule dans toutes les parties des maisons et la consommation est importante , trop ! Pompe aspirante et foulante dans la cour. 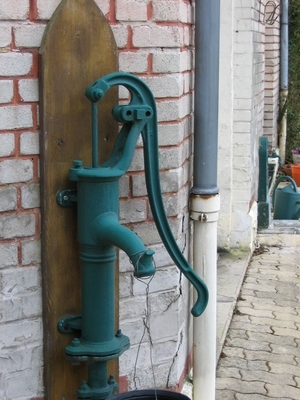 After the meal at noon today I looked like in a dream at the old hand pump hung at the wall in our backyard and also at the « public « fountain just its side . . Only this last is working and used to wash the car or water a part of the garden ( not too much ) . The hand pump was in Janine ‘ grandmother ‘ s kitchen a long time before the war II . Nowadays there are many taps in the houses and also wash machine, dishwasher , bathroom etc…; The water is running in all parts of the houses and the consumption is high , too high . Je connus un temps où les gens n ‘ utilisaient pas l ‘ eau si facilement et l’ économisaient . 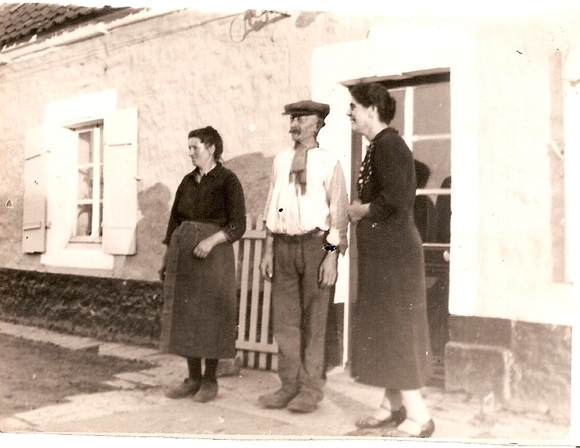 La photo ci – dessous montre mes grands parents , côté maternel , en face de leur maison dans un petit village avant la 2ème guerre mondiale ..Pas d’ eau courante mais un puits dans la cour .Un seau se trouvait à l’ entrée à l’intérieur avec de l’ eau propre et fraîche venant du puits. Il fallait y faire attention car elle servait pour la toilette et la cuisine . D’ autres seaux étaient utilisés pour abreuver le bétail . Pas de salle de bain , ni de toilettes intérieures naturellement . Dans les années 30 certaines maisons avaient un robinet intérieur comme celle de mes parents qui était neuve . Sur la photo ci – dessous le robinet d’ eau froide est juste derrière ma mère préparant un poulet près de l’ évier ( 1952 ) . Cette maison se situait dans une petite ville et beaucoup d’ habitations n’ avaient pas l’ eau courante . Les gens allaient chercher leur eau à la borne fontaine publique sur le trottoir comme celle photographiée ci – dessus . In the years 1930’s some houses had a tap inside such my parents ‘ house which was new . On the picture above the cold water tap is just behind my mother who was preparing a chicken in near the sink ( 1952 ). The house was standing in a little town and many others had no tap inside . People went to take their water to the pubic drinking fountains on the sidewalk such the one in our backyard ( pictured above ) . En ces temps l ‘ eau était précieuse et économisée . La vie était plus dure mais on ne manquait pas d ‘ eau ici ou là, les sources étaient abondantes et il y avait des truites sauvages dans les rivières qui n’ étaient pas polluées . At this time water was saved and was precious . Life was harder than now but there was no lack of water here and there ,the sources were abundant and there were wild trouts in the rivers, not polluted . Love your pics of your family. I like old things like your pump. Hope all is well for you. Michel, ta raconte d’histoire de l’eau est très fascinante pour moi! Merci! J’aime bien des photos de ta famille. L’eau est le premier des biens pour la vie , Louisa. A beautiful series of old photos. I love the water pump, it’s beautiful . As a child I lived in Germany for a while. Water was precious even in the 70s , we rented the upper floor of a house belonging to a lovely family. baths were infrequent., daily baths were frowned on. 😮. We take so much for granted. Thank you for sharing. Yes you have interesting memories to relate to make some posts , Bonnie. Water is a precious commodity without which we would be unable to live. In Southern California, we are wishing for light rains through the winter (none is predicted for at least the next two weeks) — but too much at once could bring on another disaster! I remember your numerous posts,Janet , about the almost drought in some parts of California . It appears that we are swinging right back into that drought! The end of our rainy season is usually in mid-March — we will be well below the average annual rainfall this year again! Thank you for sharing your family history, Michel. I enjoyed looking at your pictures, and seeing the water fountain in your backyard. I am glad this pleases you ,Linda. Ma grand mère avait une pompe à bras, qui puisait l’eau du puits, et qu’il fallait amorcer avec une gamelle d’eau. Plus tard est arrivé la pompe électrique, chromée et très bruyante. Quand j’ai acheté ma maison, il y avait, dans la cour, une vielle pompe à bras Deville des années 1920. Elle était juste décorative, n’avait jamais servi, alors que c’était une bien belle vraie pompe. Je l’ai donnée. Merci pour ces évocations, Michel. On est encore un certain nombre à avoir connu que dans un passé récent obtenir de l’ eau n était pas si simple . My husband’s grandmother saved the water that she washed dishes in to water her flowers. I remember my grandmother having a hand pump on her back porch. The water was cool and tasted much better than the treated water that we have today. Your Mother is beautiful! Thanks Gail to share your memories about water two generations ago and for your compliments to my mother . Oh! I love seeing your family photos and hearing some history of your precious family, Michel! I think everytime we take a drink of water, we should say a thank-you prayer. So very interesting. It’s good to look back and see how are grandparents lived. I am spoiled since I can’t imagine not having enough water. It makes me think that people did not have lawns…Lawns use way too much water and our golf courses, swimming pools use gallons and gallons of water…So many ways that people use and waste water. Thanks for posting something that is a reminder to us on how much we depend on such a basic need. John mentioned his mother washing clothes in the river. We waste so much today. John’s mother washed clothes in a river ? His memories would make intersting stories to post, Françoise . Yes water is our first basic need . When I was stationed in Kaiserslautern, Germany in the early 1970s, two other soldiers and I rented an apartment where you put 10 pfennig coins into a gas meter to get a measured amount of gas to heat water for a bath or to wash dishes. The American who had the apartment before us said it took 50 pfennigs worth of gas to take a bath. The first bath I took there, I put in 50 pfennigs worth of coins, and had so much hot water, I never used it up. From then I experimented with how much I had to put in to get a good bath. There was a hand shower. Instead of filling the tun up to the top, which the American apparently was doing, I wetted myself down with enough water to make the soap lather, then turned the water off. Once I was all soaped up, I used the hand shower to rinse the soap off, and stopped as soon as the water turned cold again. Cost of gas per bath/shower: 10 pfennigs, 40 pfennigs less than we were told a both would take, and I was more than clean. It was an interesting experience that made me aware of how little water one really needs to use to bathe adequately. Or gas to heat that water! To this day, I use the same technique when showering, even though the cost of gas and abundance of water where I live don’t necessitate being so frugal if one doesn’t want to be. Waste not, want not! I use the same way as you in Germany for body wash, Doug. I have to say I was very pleased to read this . Je me rappelle d’avoir tiré de l’eau d’une pompe comme la tienne à la maison de mes tantes lorsque j’étais gamine et je passais mes étés à la campagne avec mes cousins… On faisait aussi la vasseille au fleuve, mais seulement pour les casseroles et les poêles. La sable fine du fleuve faisait bien briller les casseroles! J’espère que vous êtes tous bien. Amitiés! Je t ‘imagine sur les rivages du Pô en train de récurer les casseroles , Annalisa . Avec le sable cela devait être vraiment efficace . Yes good memories of my youth, Gayle. It was almost the same for my parents at the beginning of the years 1950’s, Marilyn.. And to cook and warm the living/kitchen it was a coal stove . I have always grown up with taps in the house, but when I was a child we would visit a relative in a nearby small town that had a hand pump in a large sink in the kitchen that was a source of great wonderment to all of us kids. And no bathroom in the house, just an outhouse, which was less delightful ton our sensibilities. I can see where the labor made the water more precious. I imagine your amazement in seeing the hand pump in a kitchen ! However it was a progress at this time. .During a long time to own a well in ones yard was a wealth , Marion. <3. I love the photos of your grandparents and mother! They are precious photos, Marica. When I was growing up, one of my mother’s sisters lived on a small acreage outside Council Bluffs, Iowa, where I grew up. She did not have any indoor plumbing except a hand pump in the kitchen. She had to pump water from this pump and boil it to wash dishes or do other cleaning. She had an outhouse a little distance away behind the house. I thought it was fun to pump water in the sink or with the pump outside in the yard. I think of that time as being simpler rather than harder. It was a little more difficult to do some of the work in the house, but life was not so rushed, so there was more time to do the work. Every time has its traditions and way of life but regarding water people ‘ s behavior was mor ecological in the past. Thanks Nancy for your memories . I learned some things from your post. Thank you for sharing! Cependant c ‘était le cas pour la plupart des gens dans les année 1940-1950. c ‘ est une question d’adaptation, Marlaine . Love this post and the family photos. Hand pumps are awesome. Love it. i am glad this post and the pictures please you, Elizabeth. Merci pour le soleil, Bernard . Nous avons eu tellement de pluie jusqu’ alors . Those are wonderful family photos, Michel! Life in a another time, when everything was precious, and nothing wasted. 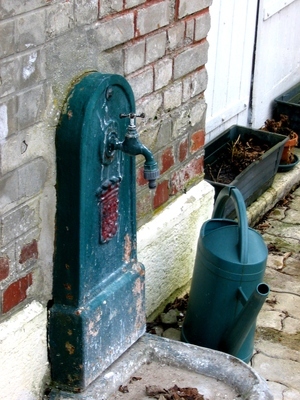 I remember seeing a house, when I was young, that had the hand pump coming up into the kitchen from a well below the house. My mother was a visiting nurse, and the elder gentleman that lived there was one of her patients. I marveled at that. .what I describe in this post ,Lavinia, was the way of life of most French people in the years 1950’s in France, some years after the war II. Something is wrong—I don’t see any photos, only in this post. It sounds like it might be only me, too. Your mothers smile just lights up her face Michel. People pay a lot of money for those pumps now. They just use the pumps as a decore. Maybe they wish for the good old days. Thanks for your kind comment about my mother, Tudy. This post is wonderful! Thank you so much for sharing this history and the wonderful photos! I love the hand pump. When I was a child both sets of my grandparents had pumps outside but my paternal grandmother also had a hand pump like this in her kitchen with a very large white enamel sink.